In 2018, Affiliate marketing was responsible for billions of dollars in sales for vendors. It was also responsible for billions of dollars of revenue for the affiliates promoting the offers. Instead of shrinking, the industry is growing. The problem is a few super affiliates are taking home most of the earnings. Not anymore, we’ve compiled a list of affiliate marketing tools, platforms, and resources to build your affiliate marketing empire. These affiliate marketing tools will cut down the learning curve, make it easier to implement campaigns, and help you find the best offers available. There are a lot of solutions that do one thing well but force you to get other tools to pick up the slack. KyLeads combines multiple tools together to help you create a lead generation and feedback powerhouse. KyLeads allows you to create popups and quizzes that turn more website visitors into subscribers. That would be cool in and of itself, but it goes deeper. Instead of guessing who your subscribers are and what they want, you can unlock that information through the quizzes and specialized survey popups. Once you add that information to your email marketing service – you can personalize the experience even further. For example, you find out your subscriber is new to strength training through a survey pop up or quiz. With that information, you can market products to them that match their level of expertise. Ready to build a massive mailing list? Start your free trial of KyLeads by clicking here and mention you came from the post about affiliate marketing tools – we’ll hook you up. The first step in optimizing your website for conversions is knowing what your audience wants. Once you know that, you can create the right content, messages, and offers. In this section, we’re going to look at tools that’ll help you research. SEMRush is a powerful competitive analysis tool. The number of features it has and continues to add is impressive. What makes it such a useful affiliate marketing tool is the ability to spy on paid advertising campaigns. You get to peel back the covers and look at what your direct and indirect competitors are spending money on. With this knowledge, you can start to craft your own profitable campaign. The paid advertising research is just one of the things this robust tool can do for you. You can also see the organic rankings of websites, get a picture of how many links they have, know how much traffic they’re getting, Etc. Sign up for a free account to play around with the tool and you’ll quickly realize how useful it is. We’ve started to use it more and more and now log in at least a few times a week. Buzzsumo is a content research tool with a host of features. It lets you search the web for content which has done well on social media in the past. They’re partnered with Majestic and give you a snapshot of links pointing to a particular piece of content. There are many options to narrow down your search. For example, you can choose to only search for long-form content, infographics, or videos. If you’re familiar with the competition, you can search their website for the best-performing articles. Once you know what has done well, you can create better content and reverse engineer the promotion process to get massive traction. It’s an indispensable tool in your arsenal if you want to be an effective affiliate marketer. The Google Keyword Planner is a mainstay when it comes to researching profitable niches, products, and topics. Over the years, the amount of information they give has been curtailed, but it remains useful. This is where you should start your keyword research journey. Even though the data is limited, it’ll give you a solid picture of where to dig deeper. Here’s a quick way to find some useful keywords. On the home page of the keyword tool, after you log in, there’s a place for you to type in the seed keyword. Below that, you can also type in a URL to a landing page. Usually, it’s your own, but you can also put in the URL of a competitor’s landing page. After you insert the URL, you’ll be taken to the page where keyword results are shown. It brings back lower volume keywords that look promising. From here, you can further research the keywords to until you pull out a few gems that’ll work well in your niche. We all know a headline is seen 5x as much as the body copy. It makes sense you spend 5x as much time creating a powerful headline. Lucky for us, this is the internet age. The CoSchedule headline tool analyzes your headlines based on a number of criteria. It takes into account the length, power words, uncommon words, and common words. They use these factors to give you a score. The higher the score, the better your headline. Always remember it’s just a tool. Use proven headline formulas to give you a headstart and tweak it from there. Always test your headlines. You can always go back and change it later. Ahrefs is another competitive analysis and research tool. The reason it got a separate mention here is two-fold. The first reason is because it has a backlink profiler that blows every other tool out of the water. The only one that comes close is Majestic. It also has some different features from SemRush which makes it a great standalone affiliate marketing tool. The Ahrefs suite has something called the content gap. Type in your website and the websites of your closest competitors and it’ll show you opportunities you have to create more relevant content. I can’t mention all the features this tool has. Some that stick out are the keyword cloud, the ranking tool, the TLD (top level domain) distribution, the robust backlink profiler, the content research tool, and the content gap feature. Google Search Console is a free tool that allows you to monitor your website. Add a line of code to prove ownership of your website and watch as the data starts to flow. From Search Console, you can submit a sitemap which will help Google index your website more quickly. Over time, you’ll also get data that shows you which search terms you’re ranking for, how often people are clicking through to your website, and search impressions. In addition to that, you’ll get insights about crawl errors, speed suggestions, and mobile optimization. You can take these insights and fix errors on your website and further improve your organic click through rate. Don’t let KeywordSpy put you off by its design. It looks like it hasn’t been updated since the early 2000’s. Fortunately, the keyword index is still useful. They claim to have over 127 million keywords and growing. If you know your competitors, plug them into the tool and find out which keywords they’re ranking for. That’s a plus but the main benefit of this affiliate marketing tool is the ability to uncover high performing affiliate offers. They have over 300 affiliate networks in their database that are analyzed and updated every day. It gives you a snapshot of the top selling products so you can add them to your promotions and reap the rewards. Finally, you can track your keywords in the three largest search engines and make sure you stay on top. Google is one of the best ways to get consistent traffic to your website. It’s free (kind of), consistent, and long term. It’s also difficult to rank for competitive keywords because everyone is working on it. LongTailPro helps you find long tail search terms that can drive a huge amount of cumulative traffic. Instead of going up against a huge brand like Mens Fitness, you’ll be ranking search terms that make you money before you know it. Their tool uses a few simple metrics like keyword competitiveness, competition, and ranking value to give you a better idea of the keywords to target. An interesting feature is the ability to see the search results breakdown. Google has started to introduce things like featured snippets and local search results which push the organic results further down and reduce traffic. When you have this information up front then you can make better decisions about which keywords to target. Moz is one of those tools everyone stumbles across when they’re doing anything online. They have a robust suite of tools that allows you to check everything from the likelihood of a domain to rank on page one to a keyword research tool. Not only do they have the tools to help you get the results you need, they also maintain a comprehensive blog that covers everything related to digital marketing. One of the tools we find the most useful is the domain authority and page authority calculator. This is a unique metric they’ve created that’ll let you size up your competition in organic search at a glance. They allow you limited use of some of their tools every month like Link Explorer, Keyword Explorer, and Moz Bar to name a few. ContactOut is a simple browser extension that helps you find email addresses and phone numbers of anyone on LinkedIn. ContactOut finds emails from 75% of Linkedin users (2x better than the next closest competitor) at a 97% accuracy rate. It’s considered one of the best freemium email outreach tools by many and for good reason. Sign up to get 50 free credits per month by default. Everyone has different needs and won’t buy some things you’re offering, the best strategy is to capture their email addresses and market to them over the long term. Here are some of the best email marketing services to make that a reality. ActiveCampaign is the email marketing service we’ve used for some time and we have very little to complain about (they’re differentiating into the ecommerce space so a lot of the features they’re adding aren’t necessarily useful for us). In a nutshell, they’ve been able to combine enterprise-level email marketing with a solopreneur budget. You get the best of both worlds. If you’ve never tried marketing automation, here’s your chance without paying an arm and a leg. Click here to read a full review and get some deep insights on how to use the platform. GetResponse is another great option when it comes to getting the most out of email for affiliate marketing. If you’re new to everything, it has a docile learning curve which means you can set up and run your first campaigns within a few minutes or hours. They have a comprehensive knowledge base, allow you to create landing pages, and even allow you to host small webinars. They focus mostly on autoresponders. If you’re looking for more automation then you’ll need to upgrade to one of their tiered packages. That notwithstanding, GetResponse will get the job done and help you make a solid affiliate revenue for your business. One of the features I like most about GetResponse is the intuitive interface. As I mentioned earlier, even if it’s your first time working with an email marketing service, you can be up and running within a few minutes. The people at Drip bill their software as an Ecommerce CRM. I don’t think that description does their service justice. With affiliate marketing, it’s important to be able to react to what your website visitors have done on your website. For example, if they’ve visited certain pages, you may want to send relevant emails. Drip was built from the ground up for this kind of behavioral segmentation. Inside the platform, you’re able to create email marketing automation campaigns that fire when certain conditions are met. One of the most powerful features of Drip is their deep integration with Facebook ads. You can control all your campaigns from within Drip and drive real results for your business. ConvertKit is a newer service when compared to some of the others. Don’t let that discourage you. It was started by Nathan Barry, someone who’s no stranger to what a good email marketing service should provide. 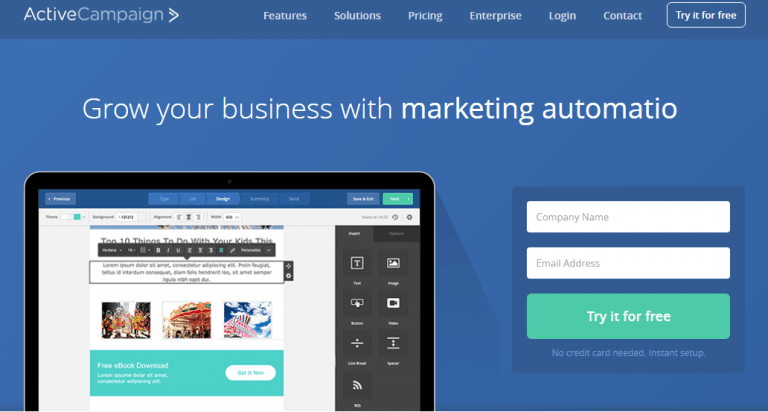 They have marketing automation baked right into the product and there’s no tiered pricing. You get all the perks and features no matter what plan you choose. The pricing is based on how many subscribers you have. One thing ConvertKit chas going for it is the ability to trigger emails based on actions taken either in the email or on your website. For example, if someone has visited the same web page multiple times, you can start a specific email sequence. If someone has interacted with a particular type of email multiple times then you can trigger a different email sequence. You can take your email marketing to the next level with the amount of control ConvertKit offers. MailChimp has been around for a long time and boasts hundreds of thousands of customers. If you don’t have the money to invest in a premium affiliate marketing tool for email then MailChimp may be for you. They allow you to collect up to two thousand subscribers for free but keep in mind the plan is limited. All you can do is send newsletters. You lose out on all the premium features you’d expect in an email marketing service. Mailerlite is an email marketing tool that combines your standard email newsletters with marketing automation features. It comes built-in with landing page software and popups that you can easily embed into your website. If you need more functionality than what’s possible with their built-in landing page builders and popups, you can easily integrate with other tools. One of the best features of this product is they give you full access to the platform for free until you pass the first one thousand subscribers. There’s no sending limit or reduced functionality. It’s ideal to get started on a shoestring budget. Vertical Response is another email marketing platform that allows you to speak to your customers and email subscribers at scale. They have a neat feature to send surveys to understand what your subscribers want from your business. The reports are comprehensive and easy to read. Vertical Response has struck a nice balance between functionality and insights which is difficult to attain. Though it doesn’t have a few of the advanced features many email marketing tools come with, they make up for it by nailing their core competency. Their delivery rate is high and you can tailor emails to fit your needs. In the end, all the bells and whistles don’t matter if you can’t get your email in your prospects inbox. Aweber is an older service on the market. Some of the largest websites and most successful marketers use it on a regular basis. If there’s one thing I can say about the service, it’s that they get your emails where they’re meant to go. Aweber prides itself on deliverability. If the backbone of your affiliate marketing success is email then the backbone of your email marketing success is deliverability. Without one, you can’t have the other. Though it doesn’t have as powerful a feature set as some of the other providers, it’s still worth the investment. Another plus is that it’s easy to learn the ins and outs of the service. Affiliate marketing is built on partnerships, when you can find the right partnerships, you thrive. The following are a few platforms that make finding those partnerships simple so you can get down to the business of making money. Clickbank is by far the largest network to find people and organizations willing to partner with you. They have everything from dating products to fitness products. All products on the platform are digital so once you sign up, just find a product that works for you and you’re good to go. I’ve been a member of this platform for years while working on different projects and haven’t had a bad experience yet. They pay on time and resolve any issues you may have in a quick and professional manner. The only drawback is that many of the vendors use overly formulaic sales pages which turn me off. Remember, any product you sell or promote is a reflection of you and your brand. If you promote something that comes off as sleazy then you and your brand, by extension, come off as sleazy. Apart from that, if you’re looking for digital goods then this is a great place to start. As an added plus, Clickbank has a training library. If you’re willing to invest in it then you can join Clickbank University as well. Finally, they have built-in analytics that let you know which offers are converting the best for you and which ones are holding you back. FlexOffers has a wide range of products, strong reporting features, and different packages to meet your needs. For a little extra, you can even get a personal manager for your affiliate marketing campaigns. If you have the necessary experience, you can find what you need using the self-service dashboard. This platform is mainly focused on cost per sale which means you only earn a commission when you make a sale for a vendor. They still have a few offers that are cost per action. These can include free trial signups, lead generation, and downloads. Many industries are represented by FlexOffers so it’ll be simple to find an offer that’ll appeal to your audience. CJ Affiliate is one of the larger affiliate platforms and they’ve been operating for a while now. Their offers are cost per action meaning someone has to sign up, buy, download, or perform another action as stipulated by the vendor before a publisher is paid. Since they’ve been around for quite a while and have been to attract many vendors to their platform. That translates into a wide range of offers for you to promote. Their reporting interface can get a bit tricky so spend some time learning it before you dive in headfirst. To implement ads and start generating revenue, you need to be approved by the advertiser. This can take anywhere from a few seconds to a few days. Most often, it’s an instant process. They have a minimum payout threshold of $50 every 20-30 days. Linkshare was founded in 1996 which makes it one of the oldest networks of its type, but is significantly smaller than CJ affiliate. Linkshare is a cost per action (CPA) network like CJ affiliate which gives you the flexibility to earn without making the final sale. One of my favorite features of the platform is the ease of reporting. When they designed Linkshare, they made sure to keep reports front and center. They have a very low payout threshold of one dollar. The drawback of their payments is that they don’t pay regularly. It’s a solid alternative to the other networks and should provide a good pool of offers for you to promote while growing your empire. ShareASale is an affiliate marketing platform that connects merchants with publishers. They’ve been around for almost as long as the internet and specialize in merchants that sell physical goods such as clothing, accessories, and automotive. They have a small area for online dating services. Because of their specialization in physical goods, their commissions are much lower than you’d see on other platforms. That doesn’t mean it’s not worthwhile, it just means you need to do the research and build your list from day one. They have a relatively straightforward sign up process. Once you’re approved, you can choose from almost four thousand merchants. You only grow what you measure. When it comes to affiliate marketing tools, the ones that help you keep track of where people are going and coming from are the most important. It’ll give you a feel for the traffic sources that are converting the best for you. Here are a few tools to make your job easier. AffJet is your affiliate marketing HQ. It’s built to help you monitor all your affiliate marketing networks performance in one place. AffJet is a tool that enables you to streamline your affiliate income reporting. Once you’ve mastered the basics of affiliate marketing and you are starting to see the sales come in, of course, you want to start reporting on your success. AffJet connects to all your networks for you and gives you one central dashboard to monitor your performance. Once you have an account, just add your networks to start importing the data. Create custom reports including affiliates across different networks, or see an overview of your entire earnings. You can keep on top of programs or networks that are doing particularly well, ones that aren’t as popular, or even spot ones that have stopped working. This means you can spend more time optimizing your site to get more sales for you – and less time dealing with the reporting side of things. Bitly is a popular link tracking and URL shortening software. You insert your long ugly link like http://example.com/my-affiliate-link-ddsafesk and it’ll spit out a shorter link. The reason for this is twofold. 1. You get a shorter link. Affiliate links are notorious for being long and unwieldy. This will shorten it and make it easier to work with. At the same time, you can make it pretty or even add a custom domain to the link. Your long affiliate link can turn into something like ky.co/link. It’s easier for you to remember and keep track of. 2. The Bit.ly app allows you to track all the clicks on your links. It gives you information such as device, location, and gender. You can then use this information to determine what type of traffic is converting best and optimize your campaigns. EG mobile traffic is converting or people using Android devices are converting. There are many options for link shortening and tracking services on the market. We use Bit.ly for KyLeads and I use clk.im for many of my personal projects. An added benefit of Clk.im is the ability to monetize every shortened link you use. This feature can turn into a viable source of income for you if you’re so inclined. Google Analytics is one of the most robust platforms of its type on the internet. For this type of functionality, you’d be happy paying a few hundred bucks a month. It’s free. Since the tool is so powerful, it has a lot of functions which escape the average user. In addition to the basics like knowing the number of site visitors and how long they stay on your website, you can go advanced. Of course, you can track where people are coming from, but you can also segment the visitors and get granular with your assessments. For example, let’s say you’re active on Facebook and get a lot of traffic. You can drill down and see what device, demographics, usage activities, interests, and a whole host of other information. You can use the information to build robust customer profiles and create highly targeted affiliate offers for them. Running through how you can use the platform is beyond the scope of this article, but here’s a resource to get you started. Be sure to check out the Google Analytics knowledge base as well. It’s helpful. If you’re not using social media in the digital age, you’re dead in the water. If you’re spending all your time on social media, you’re dead in the water. The following tools are ideal for managing and scheduling your posts to your social media accounts. In addition to that, I’ve included a few social media analytics tools. Hootsuite is an older player when it comes to social media management. They’ve built an easy to use platform and have a free forever plan that allows you limited access to the tool for multiple social media accounts. Here, you can schedule your tweets, Facebook, Google+ and other social media accounts. Hootsuite was built to serve as the hub for your social media management needs. More than just scheduling, you can monitor the feeds of multiple social media accounts and add teammates for easy collaboration. One of my favorite features is the ability to manage social media from a mobile device. You’re not always at a computer. I’m not always at a computer, but we need to get stuff done. The mobile app makes that possible. Hootsuite doesn’t stop with their app. They have a comprehensive training library and certification program that’ll keep you on the cutting edge of social media. The last thing I want to mention about Hootsuite is the built-in analytics. If you’re using them as your predominant social tool then you’re in luck. At the end of every week, they’ll send you a breakdown of your most popular links, number of clicks, and the geographic location of the users. Buffer is another social media management tool that’s widely known and used. They boast a user base in the millions and have an uber-popular blog to boot. That’s not what this is about. Their social management tool allows you to schedule to all the major social platforms with just a few clicks and even pulls some of your metadata for you. They have a host of complementary services like Pablo that makes it easy to create engaging social only content. Buffer only takes a few seconds to set up and start using. The emphasis is on scheduling updates to your social accounts and because of that, they don’t have a strong reporting feature. The one thing that sets Buffer apart from other platforms is their amazing customer service. They practice what they preach and have created an enviable culture that rubs off on their staff and customers alike. Instagram is one of the largest social media platforms. With that size comes opportunity and something else – competition. Without the right Instagram strategy in place, it can be difficult to peek your head above the noise and gain a huge following. Content is just one part of the puzzle. Unless you have a dedicated social media manager or the right tools, it’ll be impossible. 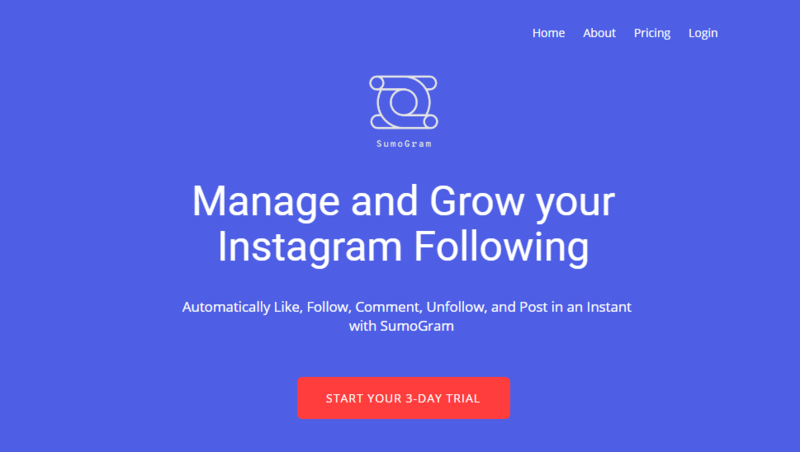 SumoGram is an Instagram automation app that allows you to do almost everything from the backend. You can schedule posts, automate liking, and follow targeted users. SumoGram doesn’t stop there, it allows you to interact with specific hashtags, blacklist accounts, and access detailed reports about your activity and growth. You can’t do affiliate marketing properly without a strong online presence. How else would you rank in the search engines, build your email list, and create specific offers? WordPress is free and one of the simplest ways to build a website. It’s what our marketing site is hosted on. They have thousands of plugins, a built-in blog, and a community of committed developers. There’s almost no task that can’t be completed with WordPress. Please use a wordpress.org account with your own hosting instead of wordpress.com. WordPress.com is free but it’s unprofessional and also limits your ability to customize and promote products the way you’d like. 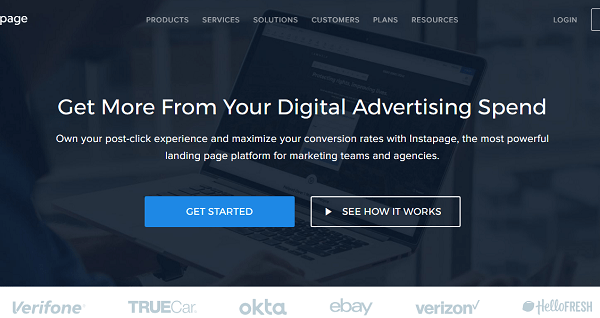 Instapage is a landing page creator that’s positioned as the best tool for agencies. That doesn’t mean an affiliate marketer can’t use it. The reason this tool gets on the list is because the page builder itself is one of the best I’ve used. There’s a free form editor that allows you to place elements anywhere on the page instead of snapping it into place. When you’re done editing the desktop version, you’ll also be able to edit the mobile version separately. They have another feature called global blocks. The problem I’ve experienced with landing pages is that if you make a change on one page, you’ll have to go back through every page individually. With Instapage, you can make a change to the global blocks and it gets changed everywhere you used them. Instapage only has two plans and is the most expensive option on this list. It’s a powerful tool but not reasonable if you’ve not started generating money from affiliate marketing. Unbounce is one of the most powerful landing page creators out there. You can do a lot with this tool and it may be a steep learning curve if you’re just getting started with digital marketing. It’s on the higher end of the pricing scale but if you can swing it then go for it. Leadpages is a popular landing page builder and the most affiliate friendly one on this list. They have over a hundred templates and a marketplace to buy more. There’s an interesting integration with Facebook ads that allows you to set up and manager your ad spend from directly inside the app. Integrations are taken seriously over at Leadpages. All of the major email marketing services are accounted for and they also connect with other services such as Stripe and Zapier. If it’s useful in marketing then they probably have an integration to go with it. Last on the list are their unique popup tools. The allow you to embed links that open into popups once users click on them and progress bars which improve your conversions. Grammarly isn’t an affiliate marketing tool per se. It’s a tool that helps you check your grammar. A large part of affiliate marketing is writing. There’s no getting around that. With Grammarly, you can install the free Chrome extension and check your writing on almost any website (it’s blocked from a few). That way, all your comments, social updates, and short form posts will be grammatically correct. It’s free for most of the features but to get advanced grammar checking, you’ll need to pay for it. We use it all that time when we’re creating content for KyLeads and other appearances around the web. Ernest Hemmingway was a novelist, short story writer, and journalist that became well known for his preference of economic prose. Where his peers would use a paragraph, he’d use a sentence. When others were using perplexed, he’d use confused. In essence, he believed that less is more and the success of his novels is a testament to that truth. Hemmingway App is a tool that tries to emulate the style Hemmingway called the Iceberg theory. When you’re done writing, copy and paste your text into the editor. It will highlight long sentences, confusing words, passive voice, and other issues in your writing. 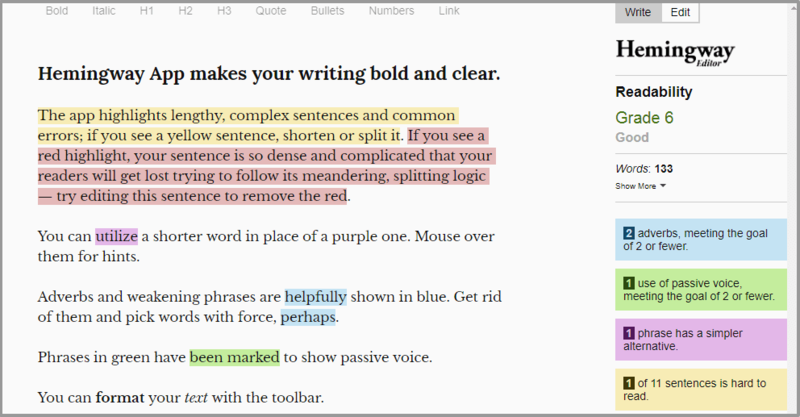 When you follow the suggestions, you’ll find your writing cleaner, clearer, and more powerful. Without traffic, all your other tools are useless. Here are the most powerful tools you can use to generate traffic to your website over time and on demand. Facebook is the one thousand pound gorilla in the room. When you talk about referral traffic from social media, Facebook is always at the top of the list. It’s different from a few years ago. The reach of Facebook pages has reduced and you have to pay to play. How to use Facebook properly is beyond the scope of this post. I’ll just touch on a few things to keep in mind. People aren’t on Facebook to buy. It’s best to get them off the platform, onto a blog post, and into your mailing list. From there you can market to them over time. Engage with your target audience in groups by being helpful. Don’t join the groups and drop your links everywhere. It’ll destroy what little goodwill you have. Set up campaigns for cheap clicks to your posts to establish social proof before you set up a campaign to drive traffic. Over time, you’ll see just how powerful Facebook can be. Right after Facebook Pinterest is the social media platform that drives the most referral traffic. This is even more surprising when you think about the fact that Pinterest has less than 20% of the monthly active users Facebook commands. Pinterest has been described as a platform for women. It was at first but the highest growing demographic now is men. A good thing about Pinterest is the high income of the people that visit the website. If you’re promoting a reasonably priced product then the people there have the resources to buy it. The backbone of generating Pinterest traffic is through groups. Use Pingroupie.com to find relevant group boards and request an invite. Billions of search queries are processed by Google every month. Not all searches are made with commercial intent. Some people are just looking for information while other people are ready to pull the trigger. Before you sink your money into ads with little to show for it, there are two things I recommend. Start with a low budget and relatively broad keywords. Cull down your list until you find a few high performing keywords. Optimize your landing pages until you can turn them off and on at will and generate revenue. Twitter has a problem with bots and the traffic has been said to convert poorly. From our experience, Twitter is a great way to create awareness around your brand but may not be the best platform to drive tangible conversions. The only thing to do is test it. Set up campaigns that use a video for the creative. These have been shown to receive higher engagement and click throughs. Scoop.it is a smaller social platform which has roughly fifteen million visitors a month. It’s built for content discovery and curation. It’s divided between a free service and a paid service for businesses and individuals. When you sign up for an individual account, you’re limited to just a few actions a day. You can curate your content into topics which makes it easy to organize and find. The more you interact on the platform, the more traffic you can accumulate. Users have the ability to suggest content for your topic boards and you can also do the same for them. Look for active boards that generate a lot of daily traffic. When you don’t have the skills to create beautiful images in Photoshop, you’re left with two options. The first is to buy stock images and the other is to hire a designer. Neither one is ideal when you need custom work in a short amount of time. For that, we have Canva. You can start with a high quality image and add your own touch to match your brand. Use Canva to quickly make the perfect images for social media, blog posts, and marketing collateral. They have tons of templates to choose from and most of their services are free. Pexels is full of high quality stock images that you can use whichever way you choose. I mean that literally. There’s no limit to how you can use the images on the platform. It’s easily searchable and more photos are being added every day. If you need high-quality images for your website or a blog post then start here. Use Canva to customize the images you get or adjust them to more closely match your brand. The platform is monetized with ads so keep that in mind while browsing so you don’t get redirected somewhere else. Unsplash is similar to Pexels. They both allow you to use high-quality images however you like without having to pay. It’s also easily searchable but seems to have a larger selection than Pexels in specific categories. If you can’t find what you’re looking for on Pexels (or vice versa) then try out the other platform. Between the two of them you’ll come across what you need. The only difference between the two platforms is the layout and how the photos are presented. Even though you can use the pictures however you want, it’s a good idea to customize them. Because they’re free, a lot of other brands use them. If a prospect in your niche browses more than one website, they’re likely to come across one image on multiple websites. With a bit of customization, they become wholly yours. Use Canva to accomplish this in just a few minutes. Affiliate marketing is a discipline that requires a wide skillset and can bring amazing returns if you’ve got all the pieces. A major part of the puzzle is having the right tools in your arsenal. Check out the tools listed here and use the ones that make the most sense for you and your business. Let me know which affiliate marketing tools you’re using or the ones you think I should add to this collection. Daniel ,Thanks for sharing excellent goldmine ideas. Great post Daniel! I do use some of the 19 marketing tools, and now bookmarking your page to check on what I might need to add later. Thanks for sharing. You’re already on top of your game then. I’m glad I could introduce you to a few more tools. Daniel – Thank you for sharing this valuable information. You just shorten the affiliate marketing curve by 1-2 years. Thank you! I wish I could’ve shortened my personal journey be 2 years. Thanks for your kind words and for reading. wowza – some serious gold nuggets in this post. Thanks for sharing! Daniel, thanks for this post. Its so informative…so many tools I didn’t know about. I’d bookmark this and come back. Thanks again! Great post. These certainly are game changers. Thanks for sharing. On a serious note, this is a great list or affiliate entrepreneur marketing tools. I would say that all these work a treat when you have your own branded Online space aka a website. Building a list while sending the traffic to a generic page is a waste of time, and is un-enterprising. Haha, my use of Aweber was minimal at best. It seems like you’re way more conversant with the tool. No, my list is random, you could check them out in any order and stumble on the one that works for you. But, I think the simplest one is Gettesponse. A brilliant compilation of the needed tools to succeed with affiliate marketing. well done Dan! Will be bookmarking this and sharing across my feed. Keep up with the good work. looking forward to your next post. Such a great list Daniel! Sure goes to my bookmarks! Very informative, some of these I use and some I just need to plain check them out! Thanks, Daniel! You’re welcome Lorraine. Thanks for reading! I see you did some strong research on Affiliate Marketing, So that’s why we suggest you please review our Affiliate Marketing Tools & Free WordPress Plugins. Thanks for lining up these Wonderful tools for the affiliate marketing.